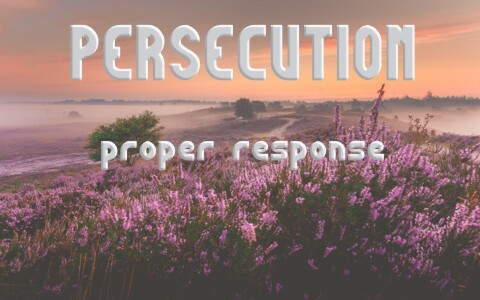 How did Jesus respond to persecution? How does He expect us to respond when we are persecuted? If you are surprised by persecution, then you (like I once did) didn’t know enough of the Bible because all believers will be persecuted and hated for Jesus’ names sake. The Apostle Paul writes that “all who desire to live a godly life in Christ Jesus will be persecuted” (2nd Tim 3:12), and Jesus had told the disciples earlier, that “‘A servant is not greater than his master.’ If they persecuted me, they will also persecute you. If they kept my word, they will also keep yours” (John 15:20). What would be really surprising is that if someone claims to be a believer but they have never once faced persecution. Paul said “all” and not “most” or “many” will suffer persecution, so if you’ve never suffered from persecution, even once, it may be time to examine yourself to see if you’re really in the faith or not (2nd Cor 13:5). The Apostle Peter adds, “do not be surprised at the fiery trial when it comes upon you to test you, as though something strange were happening to you” (1st Pet 4:12), so all believers should be suffering persecution and all members should be going through a trial from time to time, so if you’ve never been persecuted or suffered through a trial, you’re either not a believer or you’re a new believer and persecution is coming and it’s only a matter of when, not if it comes. Most of us, before we were saved, probably wanted to seek revenge or to get even if someone hurt us, but once the Spirit of God enters in, and we become new creations in Christ (2 Cor 5:17), we begin to soften and not respond in kind to how we’re treated, but it is still difficult to treat others with respect when we are not treated in a similar fashion. Even so, Jesus said “bless those who curse you, pray for those who abuse you” (Luke 6:28), so not only do we “do good to those who hate you” (Luke 6:27), we bless those who are cursing us. As hard as it is to imagine, this brings a blessing, as Jesus promised “Blessed are you when people hate you and when they exclude you and revile you and spurn your name as evil, on account of the Son of Man” (Luke 6:22)! Even more, we should “Rejoice in that day, and leap for joy, for behold, your reward is great in heaven; for so their fathers did to the prophets” (Luke 6:23), just as the apostles rejoiced after being beaten for preaching the gospel, so right after they had been beaten, is says, “Then they left the presence of the council, rejoicing that they were counted worthy to suffer dishonor for the name” (Acts 5:41). Guess what brings a blessing? Being hated! Wow. That’s not what the world thinks when it comes to being blessed is it, but the Apostle Peter says “If you are insulted for the name of Christ, you are blessed, because the Spirit of glory and of God rests upon you” (1st Pet 4:14), and don’t you want the “Spirit of the glory of God resting upon you?” I’m sure you do, but it comes with being insulted because you follow Christ. The apostle’s once “left the presence of the council, rejoicing that they were counted worthy to suffer dishonor for the name” (Acts 5:41). Could you do that? Probably not without the Spirit of God helping you to love the unlovely, but we too were once most unlovable but God loved us first or made the first move in saving us (1st John 4:19), so “if anyone suffers as a Christian, let him not be ashamed, but let him glorify God in that name” (1st Pet 4:16). Jesus said “If you love those who love you, what benefit is that to you? For even sinners love those who love them. And if you do good to those who do good to you, what benefit is that to you? For even sinners do the same” (Luke 6:32-33). You are never more like God when you love those who hate you, again, Jesus promises “love your enemies, and do good, and lend, expecting nothing in return, and your reward will be great, and you will be sons of the Most High, for he is kind to the ungrateful and the evil” (Luke 6:35). What He is saying is that if we only love those who love us, then we’re not different from the world, but to love those who hate you, that’s a godly thing. Jesus Himself said, after they had nailed Him to the cross, “Father, forgive them, for they don’t know what they are doing” (Luke 23:34a). When Jesus was reviled, He didn’t revile back, as we might do. Peter wrote that “When he was reviled, he did not revile in return; when he suffered, he did not threaten, but continued entrusting himself to him who judges justly” (1st Pet 2:23), and that’s because Jesus trusted the outcome to the Father. The question is, do we when we are hated for His name’s sake? We should “Consider him who endured from sinners such hostility against himself, so that you may not grow weary or fainthearted” (Heb 12:3). Rather than respond in kind, we are called to “Love your enemies and pray for those who persecute you, so that you may be sons of your Father who is in heaven. For he makes his sun rise on the evil and on the good, and sends rain on the just and on the unjust” (Matt 5:44-45), and “Blessed are those who are persecuted for righteousness’ sake, for theirs is the kingdom of heaven” (Matt 5:10). We lose that blessing when we return the insults and name calling. We must understand how Jesus reacted to hatred in order to show the lost that we are His disciples. How will they know? Jesus said, “A new commandment I give to you, that you love one another: just as I have loved you, you also are to love one another” (John 13:34), and it will be “By this all people will know that you are my disciples, if you have love for one another” (John 13:15), and “all people” means “all people,” whether they are in the church or outside in the world. When someone hates you, love them; when someone insults you, take it as a blessing; when they do bad things to you, do good to them; and when you are persecuted for Jesus’ sake, remember that “your reward is great in heaven, for so they persecuted the prophets who were before you” (Matt 5:12). All who live godly will suffer persecution, but the way we respond can either run people off by responding in kind and showing we’re no different than the world is…or we can give them what they don’t deserve and treat them with love, prayers, and blessings, just as God gave to us what we didn’t deserve, and it’s called grace. Learn more from Jesus here: What Would Jesus Do? Tagged as: Christian tips and advice, persecution, proper Christian response, What Would Jesus Do? Thanks for the article Jack. I think you guys should write and article about when a Christian has a right to defend themselves or to take up arms against the enemy. There is a side to being a Christian when force is necessary. IE someone breaking and entering. Defending our countries interest as a soldier. All who believe in Him have eternal life, but whoever does not believe in Jesus is condemned (John 3:16-18, 35). Previous post: Why is Hebrews Chapter 11 Called the Hall of Faith?